Ogden on Politics: Will Council Democrats Foolishly Hand Indianapolis Mayor Greg Ballard an Election Issue With Rebuild Indy II? 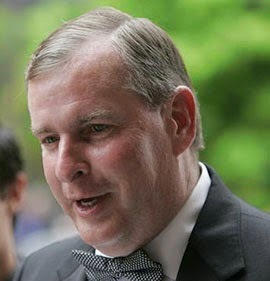 Will Council Democrats Foolishly Hand Indianapolis Mayor Greg Ballard an Election Issue With Rebuild Indy II? Democrats won the first battle over Mayor Greg Ballard's Rebuild Indy II plan. The Indianapolis Mayor announced that he had retooled the plan by knocking $50 million off of it and shortening the term of the planned bonds from 30 to 20 years. Both are big steps in the right direction. Now, I'm anxious to see what the Democrats propose. In my view, the biggest sticking point with the Mayor's first plan was the length of the bonds. Park improvements, sidewalk repairs, and road and street repairs made now would not theoretically be paid off for 30 years. If you think of how often some of those things are repaired or updated, you might be paying for something that had to be redone. Councillor Jeff Miller pointed out to me on Twitter that many of the projects on the Mayor's list were neighborhood projects and streets that see less travel than main thoroughfares. Streets that typically last 20 years without improvement. What Jon sees as a battlefield victory is what I see as a weakness in the Democratic caucus. Apparently Mayor Ballard and Council Republicans think they can simply tweak the plan a bit and Democratic councilors will defect to hand the Mayor a major re-election issue. Make no mistake about it, the Rebuild Indy II plan is as fiscally irresponsible proposal as I have ever seen. It is embarrassing that it is being proposed by Republicans. Proposal 13-250, heard by the Public Works Committee, would have allowed the city to float $150,000,000 in 30 year municipal bonds "to finance certain street, road, curb and sidewalks improvements." obtained from the sale of the city's water and sewer utilities to Citizens Energy. There is only $20 million left from the $400 million received from the sale. As been noted on these pages before, the money the City received was not "free" money. To pay the City's purchase price Citizens had to take out a 30 year loan. We the public, who own Citizens Energy, have to pay that loan back. The sale was like a wife taking out a loan to buy a car from her husband, then her husband spending the money ignoring the fact that household income still has to be used to pay back the car loan. Back to Proposal 13-250. $150 million would be borrowed using 30 year bonds. The money though would have to be spent in three years, no more than $50 million per year. Public Works Director Lori Miser repeatedly insisted that under the ordinance the City could borrow as little as $135 million, which fact she for some reason seemed to believe was a key selling point but no one took seriously. For good reason. If there is one thing I learned about how the current administration operates it is that any loan or tax authority will be maxed out. Therefore, Pat Andrews of Had Enough Indy's excellent take on this issue, my analysis of the bonds will focus on the $150 million figure. Under the ordinance the City is authorized to sell the $150 million in bonds to the Bond Bank for no less than 98% of par value. That means the Bond Bank can buy the $150 million in bonds from the City for as little as $147 million. So we lost $3 million there. The ordinance caps the bond interest rate at 7%. Deron Kintner, Deputy Director and counsel for the Indianapolis Bond Bank who strangely is also Deputy Mayor for Economic Development (conflict of interest anyone? ), however, said the current interest rate is projected to be about 4.99%. The ordinance caps the interest at 7%. Kintner indicated that debt service (the monthly payment including principle and interest) on the 30 year bond would be about $9 million. Well, Kintner conveniently rounded that down. The annual debt service is $9,651,792. Over the course of 30 years, taxpayers, on the $150,000,000 bonds would have to pay back $289,553,741, i.e. that $150,000,000 bond would cost $139,553,741 in interest plus the aforementioned $3 million. During her PowerPoint presentation, Miser went through a number of projects that could be addressed if the Public Works Department received the money. To further entice councilors into voting for the proposal, a longer list of possible projects were provided not all of which could be covered be addressed by the $150 million. Some of the Democratic councilors, most notably Pam Hickman and Zach Adamson picked up on the fact that many of the projects were repaving and sidewalks, improvements that aren't going to last anywhere close to 30 years. Controller Jason Dudich attempted to come to the rescue saying that part of the requirement of getting the money is that any improvements have to last 30 years, which seemed to contradict Miser's emphasis on repaving projects for which the life expectancy is much shorter. But the requirement is actually that the projects funded by the 30 year bonds only have to have an "average" life expectancy of 30 years. Who conducts an audit to determine that the life expectancies assigned to the improvements are accurate and that the average is 30 years? My guess is no serious audit is conducted because the City didn't seem in the least bit concerned that the list of improvements would fall short of that 30 year requirement. So the administration and Republican councilors wanted to take out a 30 year bonds, which money is to be spent in three years on improvements on road paving and sidewalks, i.e. many of which improvements won't last anywhere near 30 years. And the revenue source which is to be used to repay the 30 year loan is so uncertain that administration officials admit that another source of revenue will have to be found to pay for the borrowing. How irresponsible can Republicans be with the taxpayers money and the future of our children and the future of Indianapolis? While 20 years is better than 30 years, there is no way of enforcing the requirement that the improvements have an "average" life expectancy of that long. As far as Councilor Miller's claim that many of the projects on the Mayor's list are for lightly traveled roads for which repaving could last 20 years, even if one were to assume his dubious claim that road repaving could last 20 years on virtually any road, the fact is there is nothing requiring the Mayor to pick a lightly traveled road to repave with 20 year money over a heavily traveled one. Given the Mayor will be facing a tough re-election battle, you can bet he is going to pick the projects where there is the most traffic and he can get the most bang per buck. Council Republicans are mortgaging the future for the Mayor's re-election bid today. That is irresponsible and a violation of fiscal conservative principles. boils down to what gets fixed (if folks 'like' it, that's good) and whether the Dem's can sell that Rebuild 2 was made significantly better because of their 'valiant' stand, it gives everybody something to crow about. Seems as though Dem's preventing anything from being done is a better issue for Ballard. Anyway, it apparently takes a lot to get Indy folks to change horses, and so far, nothing seems to have stuck like property taxes did in Peterson's day.